Carl Jean-Louis, better known as Dextah, is a Chicago native currently residing in Northern California. His work with various artists including Age, Dday One and the Bash Bros., has displayed his love for sampled beats, hard drums and contemporary rap. 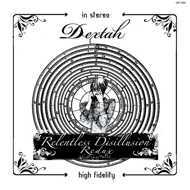 Originally released by the seminal New York label and Blog Grandgood (Dj Signify, Grandmaster Caz, etc) “Relentless Disillusion” is Dextah’s first official full length and is evocative of a David Lynch soundtrack. This current version “Relentless Disillusion Redux” is being released for the first time in digtal format including bonus tracks. Also available this time around is a special limited vinyl version including download code (200pcs) sourced from recently uncovered copies of the original pressing from the archives of the artist. B1. Why Can't I Talk To Em?